Mesa was our first Bug & Weed MART location and our Mesa store is conveniently located just north of Hwy 60 on Gilbert Road. With many other retail stores in the same shopping center, stopping in at this Bug & Weed MART location makes it easy to get a lot of the shopping you need to take care of in one stop – and have breakfast and lunch at the nearby restaurants, too! We are neatly tucked into a strip mall and sell all the items you’ll need to control bugs and weeds on your own, though we also have expert advice that has worked for our loyal customers for over 35 years. 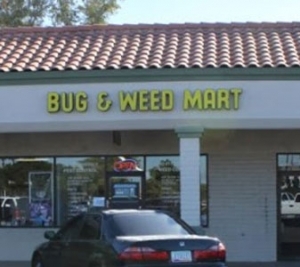 Situated in the east valley of the Phoenix metro area, our Mesa Bug & Weed MART store is close enough to the freeway to make it the perfect one stop pest control shop for commuters. Living in an urban area means different pests might be bugging you, but we carry all the supplies you need to rid yourself of scorpions, ants, feral cats, nutgrass, and more. And if you’re not sure what kind of insect has now invaded your home, we sell test strips to catch those little buggers so you can bring them into any one of our five Valley locations, where we will not only be able to tell you what they are, but sell you what you’ll need to get rid of them. Stop in today to see how we can help you get rid of bugs and weeds. Our EPA-regulated products are safe for your family and pets, yet strong enough to eliminate what’s bugging you.